According to recent research from CBRE, the London Borough of Tower Hamlets is expecting the highest population growth in the next decade at 20 per cent[i], in comparison to London’s average, 12 per cent. In addition, CBRE has forecast a 19 percent five-year house price growth[ii]. The area has gone from strength to strength in recent years, with many young Londoners attracted to its regenerated zones and hipster hotspots. Located in sought-after Stepney in Tower Hamlets, L&Q has recently unveiled its latest East London development, NEO, ideal for young professionals looking to put roots down in this increasingly popular borough. Situated on Aston Street, a quiet residential road lined with Edwardian and Victorian terraces, NEO comprises a stylish collection of one and two-bedroom apartments, with a selection available with the London Help to Buy scheme. 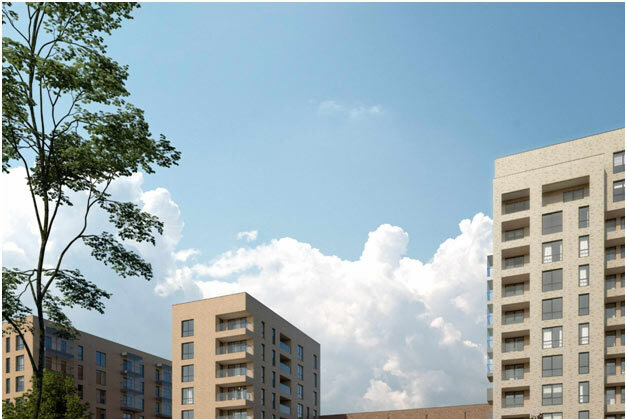 Residents will benefit from living in a well-connected Zone 2 location, with the nearest station, Limehouse, just a 10-minute walk away, whilst also enjoying all the entertainment and leisure facilities that vibrant Stepney has to offer on the doorstep. The development will cater for all needs, including providing a 24-hour concierge service and a residents’ gym and studio. Interiors at NEO are sleek, with a design-led urban feel and an exceptionally good finish. A flowing open plan design makes them perfect for modern life. Kitchens are contemporary in style featuring an integrated Bosch oven and hob, fridge/freezer and dishwasher. All apartments also boast their own private outdoor space in the form of a balcony or terrace, as well as access to communal landscaped gardens. With plenty of green credentials, energy efficiency is high at NEO, which will help to keep residents’ bills low. Just a short walk away from the development lies Commercial Road, Stepney’s high street. Here, residents can enjoy an abundance of galleries, artisan cafes, craft beer pubs and live music venues. For example, Troxy, a famous Grade II listed live music venue features a year-round calendar of live music performances, including seasonal events. There is also a wealth of parks and nature reserves within walking distance of the development. Whitehorse Road Park is located at the back of NEO, with several of the homes boasting beautiful views over the parkland. Situated within a conservation area, Tower Hamlets Cemetery Park is just over one mile away, providing 33 acres of nature reserve, an ecology building, a pond as well as plenty of meadow, glade and woodland walks. Limehouse Station DLR is under a 10-minute walk away from NEO, offering connections to Canary Wharf in five minutes, and Liverpool Street in nine minutes. Stepney Green station is also within walking distance, connecting residents to Whitechapel in just two minutes, Monument in nine minutes and London Victoria in 22 minutes. Crossrail is anticipated to launch in autumn 2019, which will further transform Stepney into a major hub, with trains to Bond Street in 10 minutes, and connections to Heathrow in 38 minutes. There are also plenty of bus routes and major roads that pass-through Stepney, ensuring homeowners can travel around the borough and beyond at ease. Prices start from £441,000 for a one-bedroom apartment. Help to Buy is available on selected homes. For more information and to subscribe your interest to receive sales and launch information, please visit neostepney.com or call 0333 234 1165.